Since Dilraba Dilmurat <迪麗熱巴>, also known as Dilireba, debuted in 2013, she has been on the fast track to stardom due to her talent and beauty. Recently an anonymous netizen posted what appears to be a photo of Dilireba without makeup. There was heated discussion and disbelief as the photo was completely different from the beauty she was known for. The photo was posted with just the caption “What everyone likes.” Though it was not specified who was in the photo, many netizens have guessed that it is Dilireba. The woman in the photo had a dark complexion showcasing many wrinkles and a gummy smile. She also had poorly applied makeup with excessive highlighting and messy hair. 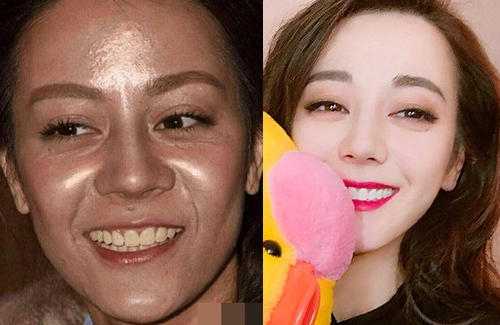 There were many comments stating their shock and disbelief at how different Dilireba looked in the photo as compared to her usual beautiful appearance. Her die-hard fans immediately came to her defense declaring that the photo was maliciously photoshopped. They called for the leaker to not act high and mighty and to post their own bare faced photos for comparison. Maybe this is an older photo? It’s not uncommon for celebs to bleach their skin and teeth. Once they have money they have to keep up their looks, to keep up with their fame. I think that is an either old photo or one that has bad lighting and no photoshopping. She clearly has make up on so that is not a barefaced photo. Her photos are now photoshopped, has good lighting and all versus the other photo. @hetieshou Most likely a combination of all of the above. and may also be an old photo from her Anarhan days. That’s when she got a bit darker for the role. @shishi This photo WAS PHOTOSHOPED by antifan.This photo was taken when she filmed the movie “21 Carat” (2016). Watch this video and you can see what she really looks like. I don’t find the baby doll skin pretty, it’s just too non-human looking. I’m around natural people everyday so the picture on the right is just not as attractive, in reality. Although, that type of look will be best when you are modeling for photoshoots related things. I don’t see how natural skin is ugly, the people around me everyday are not ugly. They’re real people. I agree and the photo on the right is clearly airbrushed and photoshopped so is not a real picture. I remember my former friend showing me a photo of her in laws taken on the same day. The regular photos looked like the one on the left while the studio airbrushed ones look like the one on the right. I don’t get why Chinese and Korean people are really this senstive to wrinkles, dark skin, pores, or even just those natural little human lines on our skin? I know that picture on the left is a bit dark, maybe being a bit lighter would make a person look better, yeah…but not to the point like on the right where every detail of your skin got smoothed out. Again, maybe it’s good for pictures and movies but not in real life. And honestly, when it comes to India and American movies/photos, they do not smooth out their skin like this and actually look way better being natural. @davy maybe you aren’t familiar with other races because its not just Chinese or Koreans that are that sensitive to wrinkles, dark skin, pores or whatever imperfection. If you do a simple Internet search you will find all skincare brands from all over the world have products targeting the same imperfections you are talking about. If you think American and Indians don’t PS their actresses or facetune their pictures then you probably live under a rock. Even the weather girls have injections and botox in American television. I don’t know where you get the idea this is just a Chinese or Korean women thing. @jayj I will give you two examples, search up Kajol and Angelina Jolie, obviously they put on make up to make themselves lighter. But, just because they put heavy make up on, they didn’t put it to the point where they look like plastic doll. They still look like ordinary people who put make up on. The details of their skin lines still show. We can still tell they are humans who just put make up on. If they come out bare face nobody would say they are ugly. If there are wrinkles, nobody complain at all. But for C-actresses, if their skin are not smoother than baby’s skin, they get called ugly. 1 single wrinkle will make them the deadliest thing. Not to mention one slight little pore, those don’t even show, everything must be extremely smooth like a plastic doll. Not saying other people do not use make up, but when they do, it’s definitely not on the same level like Chinese and Korean. Yeh. For a chinese celebrity it is normal to not recognise her after she removes her makeup. @davy you really should read up other forums where these two actresses are torn apart for looking old, wrinkled, outdated and past their primes. You heard of Kylie Jenner? She’s what? 21? People from all over the world are tearing apart her looks online. From fb to insta to YT. Her skin is terrible, cake face, heavy on makeup, fake facetune, she’s got wrinkles around her eyes when she smiles, etc. etc. Not a single actress in the world is exempt from criticism of looking old, wrinkled, fat or something disgusting. Not a single one. Just like how you kept criticizing Asian women for looking like plastic dolls. It’s also interesting to note, in Asia products that targets skin imperfections, wrinkles or acne is much more regulated than say USA. In the USA their products are much higher in strength and aggressive compared to Asian products. Some products aren’t legally allowed to be sold in Asia because of the higher strengths. @jayj I think that in case of Kylie Jenner people mostly comment about her PS. Her before and after pics were so jarring that people who doesn’t know will think that it’s two different person. @windy I’m using Jenner as an example to show davy how stupid his line of thinking is. Somehow only Asian women are capable of having plastic surgery and looking different while wearing makeup but American women would somehow look natural. This line of thinking comes from the education they receive in the west that “it’s not the same in the west as it is in the east”, “we’re not like that”. @jayj Jenner’s case would be quite different because of the big obvious reason, moreover she owns a cosmetic company so of course there could be other factors like competitors spreading hate. Also, visiting haters forum, nobody would join those forum unless they’re a hater, those pages do not create factual stuff but biased group talks only. In general (the general idea), most of the time, MOST of the time you will see so much more supporters in the West who love natural people. The group of haters could only persist in their own little forum, that doesn’t count, but the public’s opinion as a whole, most people would not get bothered by wrinkles. Just go pick any American movie at random you will always find the main actors NOT always about being young and in good skin condition, they are allowed to have wrinkles. The commentors would not talk about those wrinkles all day long. BUT, 95% of the time in C-dramas today, nobody is allow to have wrinkles right? Because that will be the only thing people talk about online. Be it women or men, everybody must have the plasticy soft and smooth skin look. Sorry to see you feeling that I’m trying to make a racist remark but that’s not my point, wasn’t sure how else to you explain without compare and contrast. If you are so against making comparison with American movies, find a C-drama from 2000-2008 and compare that with today’s drama. The difference is quite huge actually. C-actors were once very natural looking, but not in today’s period. The filtering effect must always be overly done or else people would be considered ugly. What is the reason behind that no director today ever have the guts to use un-filtering their dramas? The sad truth, natural people are being considered ugly now to c-netizens. @davy You don’t have to go to a haters forum to see nasty comments of any actress. Twitter, Facebook, Insta, Youtube, Snapchat are all popular social media sites that have nasty comments aimed at the actresses you have mentioned and more. It’s also not a “small amount of people”, it’s a LOT of people criticizing them for their looks, including wrinkles, pores, being old, fake, etc. etc. They aren’t excluded from being criticized just because they aren’t Asian. That is the most ignorant thing I have heard of. Also, if you are telling me the mass majority of people are commenting in one way I would love to see some numbers or well researched facts and not something you “feel” is the truth. Also, Kylie Jenner is not criticized because she has a cosmetics company, she’s criticized because she’s a well known celebrity. People aren’t talking about her business, they are talking about her looks. They are saying she’s fake, ugly and plastic. It’s also funny how you mentioned American movies having “older” actresses or whatnot. There are countless “older” actresses complaining about not having enough work BECAUSE of their age. Google is your friend. My main point is, its ignorant of you to complain about C/K actresses looking fake when its exactly the same thing in anywhere around the world. You don’t have to take my word for it, go on insta and search MAKEUP. You would see a million pictures of Asian AND Non Asian women wearing makeup and looking different than NOT wearing makeup. It’s somehow shocking to men like you that women wearing makeup would make them look different. @davy I have to agree with Jayj. Not just Korean and Chinese. For example, in Vietnam where women cover up from top to bottom. Many women are just afraid of getting old and ugly so they try to prevent and cover them as much as possible. This includes myself… I’m in my late 20s haha and I’m already using anti-aging stuff, hahaha. I think it may be a photo from when she was 18 and filming Anarhan (she got darker for that role). Potentially bad lighting, but could also be the person adding features to make her look worse. Even if that photo were original, she has skincare sponsorships now, so obviously her skin is much better. When watching Running Man, there are a few instances where we see her without/minimal makeup and she looks great! I thought she didn’t look good in her previous works because there were minimal filters. Many should know by now pics are photoshopped. get over it people, it’s just a bad photo. anyone would look bad in a big headshot with bad lighting. plus she’s better looking than most people in the bad pic. It’s a terrible picture. I don’t think it is photoshopped. Her usual pretty pictures are photoshopped. But she’s not ugly. Just without makeup, everyone will look less glamorous. @funnlim This photo WAS PHOTOSHOPED by antifan.This photo was taken when she filmed the movie “21 Carat” (2016). Watch this video and you can see what she really looks like. Fans need to get over their unrealistic expectations of beauty. People have wrinkles. They have bad skin days. And bad hair days. And then, when celebrities try to confirm to those unrealistic expectations by getting botox or surgery, fans bash that too. I would really like to see one of these supposed chinese beauties in real person though. Not that i enjoy movie star hunting because I would much rather meet a sports star. It is just that I’m curious if these actresses are as beautiful as they are hyped up to be because there are a lot of photoshopping and high definition used these days. Based on photos and make up on TV some look close to perfect but when I’m holiday in China, I find that the majority of chinese women have many appearance flaws. In Europe there are less of these flaws in my opinion. Do you love this actress for her face or for her personality? I don’t get why people act like they only like the actress/actors for their outer beauty more than inner beauty. In my opinion she’s beautiful with and without make-up.